I haven't been very proactive when it comes to skin care, but I'm now determined to overcome my struggle with acne. Here's a brief history of the things I've tried. I've been taking Ortho-tricyclen off and on since I was 19. The hormones always successfully clear my skin within weeks. I look amazing! Sadly, as soon as I stop taking them, the acne returns in about a month. I'd prefer not to take birth control pills because I have a family history of cancer and cancer and extra hormones are besties. Still, sometimes people do stupid things for immediate solace and I am no exception. Weird thing is this year each of the three different types of birth control pills I tried (ortho tricyclen, ortho tricyclen lo and ortho-cept) caused me to have a million side effects including 21 EFFING DAYS of menstruation every month for 8 months!!! About two months ago, I finally had enough and stopped taking the pills. Of course, my zits came back. I decided to get unlazy (to borrow my friend Savi's term) and put some effort into keeping a simple skin care routine and see what happened. 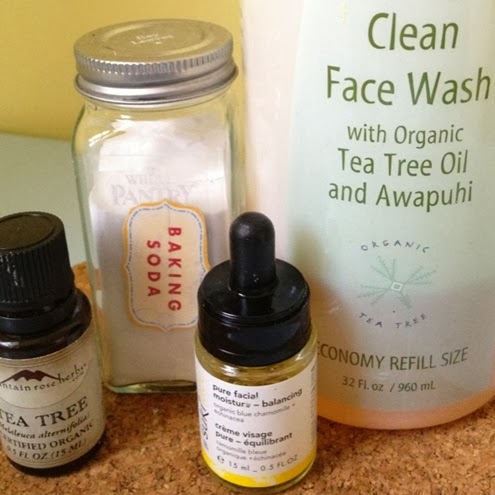 Wash my face with Dessert Essence Tea Tree Oil Face Wash. Honestly, it's the same thing I've been using for years of good skin and bad skin months. I like that it's all natural and toxin-free but I wouldn't refer to it as a wonder wash or anything, at least not for me, but again the reviews online are amazing. Gently pat face dry with a towel I only use on my face. Splash witch hazel extract onto my face and let it air dry a little (about15 seconds). If I have a blemish, I wet the tip of a cotton swab with water and add a drop of tea tree oil. I use the swab to spot treat the blemish. I've begun loving my skin. I cut out negative talk about it. I don't say things like "I have bad skin" anymore. The positive talk is slow coming, but I'm working towards it. I hope someday soon I'll be able to say, "I have beautiful skin." I recently began chanting for clear skin. If you're not Buddhist, praying would probably work for you. At first, it seemed trivial to ask for surface things like this but if having clear skin will make me happy, why not! The Universe/ God just wants all of us to be happy! I try not to touch my face. Especially my pimples, even when they seem to be just begging to be picked. So hard, but so worth it! Less sweets and more exercise. Being healthier means I'll have healthier looking skin too. Win-win! So far, I noticed this morning that my skin looks pretty good and is blemish free. P.S. Check out my Adios Acne! (Naturally) board on Pinterest. Are you challenged with acne? What works for you?